We need more Māori stories in the mainstream. We need more Māori films, Māori video games, Māori books, Māori comics, Māori TV shows. There’s so much untapped potential in Māori history, culture, and folklore for stories across all media and spanning all sorts of genres, and The Dead Lands is a very convincing argument for that. Set in a pre-colonial Aotearoa, The Dead Lands follows Hongi’s journey for revenge after a tenuous peace is shattered by the slaughtering of his tribe. His quest takes him through the titular Dead Lands, said to be home to a fierce taniwhā, but Hongi instead finds aid from a fierce, nameless warrior who makes the Dead Lands his home. It’s essentially a Māori take on a martial arts action epic, and that is a beautiful thing indeed. Aotearoa’s famous scenery makes a magnificent backdrop for epic fights and adrenaline-fuelled chase scenes. Mau rākau is a powerful, exhilarating form of combat to watch, and it’s made all the better by excellent choreography and camerawork that spotlights the juxtaposition of grace and brutality. At the same time, The Dead Lands is a coming of age drama. Hongi is, initially, a rather sheltered and weak boy. He’s been taught to fight, as most young Māori men were, but he’s the son of a rangatira, born in a time of peace. He’s never really had to put those skills to the test, so when war is thrust upon him with the attack on his tribe, his instinct is to flee and hide. In doing so, he manages to escape the slaughter, but being the only survivor drives his motivation to seek revenge and “become a man” in the process. It’s the Hero’s Journey, a tale as old as time, but in a Māori context. The Dead Lands is a celebration of Māoridom without a doubt, but critique is a key part of that celebration. Like many a martial arts film, characters in The Dead Lands are driven by honour. The quest for glory and mana is the reason that the main antagonist, Wirepu, attacked Hongi’s tribe in the first place—he was frustrated by their peoples’ peace and the lack of warborn mana that came with that. Hongi’s revenge quest, too, is one of honour as he seeks to redeem himself and his hapū in the eyes of his ancestors, his tūpuna. Historically, this was cause for much warfare among Māori, as tribes sought to increase their mana by triumphing over others. To lose was a dishonour, so defeated peoples would often seek utu—a restoring of balance through retaliation. Of course, there were practical reasons for war as well, like resource scarcity, but mana and utu were the catalysts for much conflict. 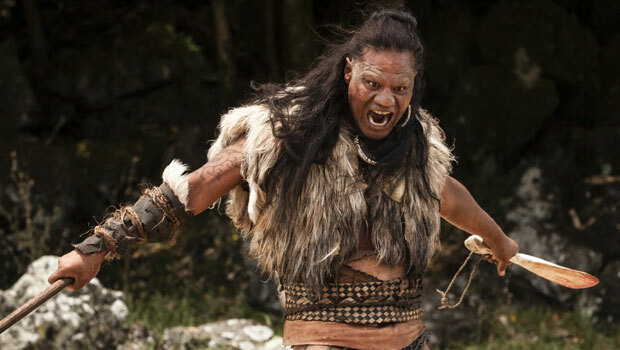 The Dead Lands celebrates this, but also casts a critical eye on it, largely through the character of the Warrior, played brilliantly by Lawrence Makoare. The Warrior is a man who, by his own admission, is without honour or glory. He’s seen the treachery and deceit that comes with war, and has seen his tribe destroyed as a result. He’s someone who has more or less given up on mana, and embraced the stories of a taniwhā roaming the Dead Lands as a way of keeping his land free of trespassers. But, as much as The Dead Lands is a coming of age story for Hongi, it’s a redemption story for the Warrior. Seeing himself in Hongi, the Warrior decides to help, but this puts him on a path fraught with confronting self-reflection. By the end of the film, both the Warrior and Hongi are searching for mana in the same way, but for very different reasons. Underscored by the talented acting of both Makoare and James Rolleston, the relationship between the Warrior and Hongi is, really, the heart of the film. It gravitates between a father/son relationship, as the Warrior mentors Hongi in warfare, to one of peers on equal standing, supporting each other and occasionally holding one another to account. There are great characters and performances across the board, but the writing and performances of the Warrior and Hongi give The Dead Lands an impressive sense of depth, making this far more than just a fun, exciting period action flick—though it certainly is that, too. The real proof of this is in the ending. I won’t say what happens, but it’s an ending that could easily have been written off as cliche and hackneyed if it wasn’t so well put together. It’s the perfect end to the path that the Warrior and Hongi had taken up to that point, and it brings the themes of the film into focus with an effortless grace. One of my favourite things about The Dead Lands, though? The whole film is in te reo Māori (don’t worry, there are English subtitles). Māori films are rare enough; Māori films spoken entirely in te reo are even harder to find. This is great for the film’s sense of authenticity, of course, but far more important is the cultural context. Te reo Māori is a language that is seeing revitalisation now, after being on the verge of extinction half a century ago. In recent decades, there has been a huge push to protect and celebrate te reo Māori; in fact it’s only due to a Te Wiki o Te Reo Māori / Māori Language Week showing that I was able to see The Dead Lands at all. At a time like this, having films in te reo Māori is so important, especially films like this, which have so much potential mass-market appeal. If people can get excited about Chinese, Japanese, and Korean-language films, they can get excited about te reo Māori ones, too. If you get a chance, go see The Dead Lands. At the very least, you’ll get to enjoy an awesome, gorgeous action movie. More importantly, you’ll see a movie that celebrates Māori—the language, the culture, the history—and that shows just how much potential there is for Māori stories in the mainstream.